Wearing this secondhand dress robe Ron isn't exactly dressed for success, but hey at least he can go to the ball, right? 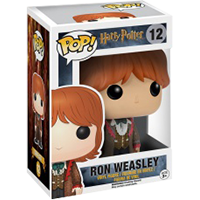 This POP figure of Harry's best friend is dressed as depicted in the fourth movie in the Yule Ball scene. Spoiler: he should have asked Hermione to the dance. This figure stands 9.5cm tall and comes in its own windowed box. Ronald Bilius "Ron" Weasley was a pure-blood wizard, the sixth son of Arthur and Molly Weasley. He was also the younger brother of Bill, Charlie, Percy, Fred, George, and the elder brother of Ginny. Ron and his brothers and sister lived in the Burrow. Ron began attending Hogwarts School of Witchcraft and Wizardry in 1991 and was Sorted into Gryffindor house. He soon became best friends with fellow student Harry Potter and later Hermione Granger. Together, they faced many challenges during their adolescence, including helping Harry face the challenges of the Triwizard Tournament. Soon after the first task, Professor McGonagall told Ron and the other Gryffindor boys about the traditional Yule Ball, held during the Triwizard Tournament. While all students above fourth year scampered around trying to find dates, Ron and Harry found it hard to ask girls to the ball. Struck by the beauty and charm of Fleur Delacour, the Triwizard Champion from Beauxbatons Academy and a part-Veela witch, Ron asked her to attend the ball with him, but fled in embarrassment without waiting for an answer. He also offended Hermione by not asking her, and then by suggesting that she did not have a date and thus could accompany him. Harry was eventually able to get them both dates with twins Parvati and Padma Patil. Ron's evening was a fiasco of the first sort. His "traditional" dress robes embarrassed him and his date, Padma Patil, and when Ron saw Hermione with Viktor Krum, he became intensely jealous. This led to a blazing argument between them during the end of the Yule Ball Ron made comments about Krum being to old for her. Though their friendship did not suffer, it was clear that both had developed feelings for each other.